Nearly every fall, I make grape juice. And, nearly every fall, I end up trying to describe, with energetic but frequently inadequate hand motions, what exactly a steamer-juicer is. Concord grapes need to be steamed to make the best juice, in my opinion. Pressed grape juice is gritty. With this pretty puppy, you just load your washed grapes (stems and all!) into the perforated basket, make sure the water pan is nicely full, and that your hose/tube is either clamped off (a clamp is included with the juicer) or is draining into something large that will catch everything, so that in the event that your phone rings with a really important call that you must absolutely take and walk away from the juicer with, because the kids will not leave you alone and you have to lock yourself into the bathroom to deal with this very important phone call, when you finally come back up for air, if your pot catching the juice was not large enough, you will have juice EVERYWHERE. Concord juice stains. It stains permanently. They could make Sharpies out of it that no amount of rubbing alcohol could ever clean up. Ask me how I know this. I dare you. I put a jar inside the big pot so that, if I am able to stay focused and paying attention, I can remove and replace it without having to pour boiling hot juice from pot to jar. The pot is simply insurance. Why bother? Because homemade Concord grape juice is the best. Ever. Remember what Welch’s used to taste like 30 years ago? Yeah, better than that. Plus, if you add fizzy water, it’s the best grape soda you’ve ever had, and it has no sugar added. Grape juice. It’s a beautiful thing. Linked to Sustainable Suburbia’s Linky List! 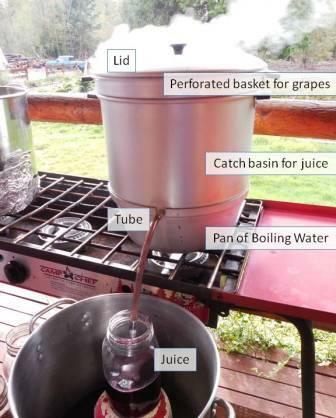 This entry was posted in Allergy-Friendly, Beverages, Canning, Projects and tagged concord grape juice, grape juice, making grape juice, steam grape juice, steam juicer, steamed grape juice, steamer juicer. Bookmark the permalink. This post is giving me a major craving for that juice. 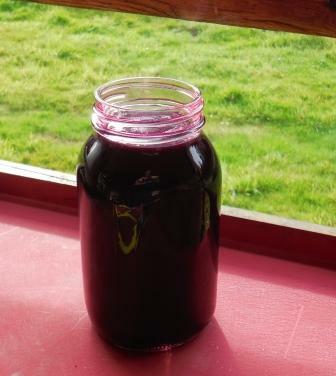 That one time a few years ago when I got grapes from you and made juice, it was sooooooo amazingly good! You’ll have to join us next fall when we make it again!